I really like the results--better than any I've ever got from standard Sony color. And the LUTS in his LUT package are the best I've ever used. Here's the out of the camera footage, and at the end a clip of his S-log 2 ungraded, and then graded with one of his LUTS. I was happier with this footage than anything I ever got on an FS100, FS700, and FS5. 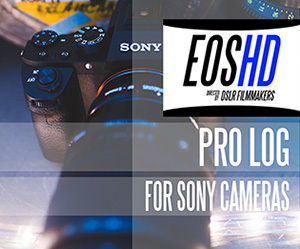 EOSHD Pro Color is a highly optimised in-camera profile for your Sony camera, to deliver straight-out-of-camera Canon-like colour. Dump the default settings and fix a host of colour issues. 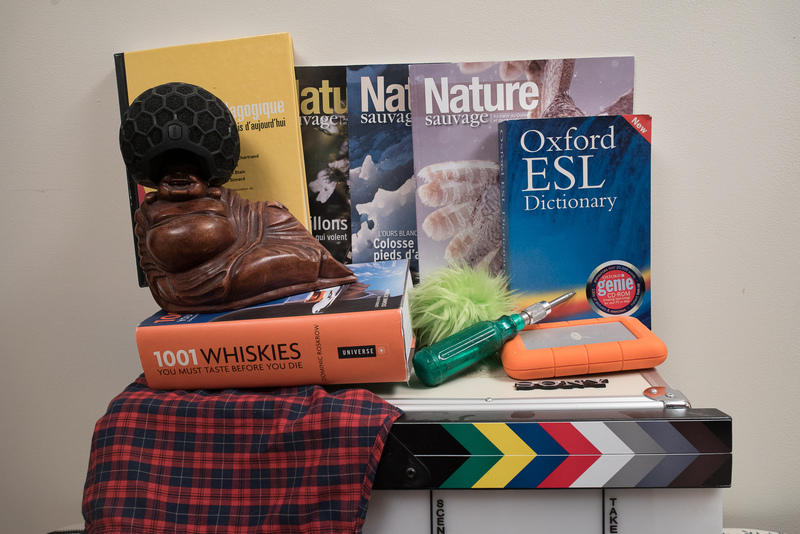 These colour correction settings are easy to apply and fundamentally change the image processor’s approach to color and white balance, lending an artists’s eye to the camera and the way it handles ambience and colour separation. 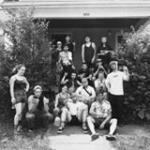 This thread is moderated daily. Some rules apply. Fair warning, posts falling into the second category will be deleted and repeat offenders will be banned. I did a quick test with a few random items - i was trying to have a lot of different colors in the image. I'm far from a being pro colorist - and I haven't tried yet to color correct those shots. Here is a quick explanation of the setup and the test. Slog2 is a bit tweak in cam by myself. The last image is a raw photo that went through lightroom with custom WB with the dropper on the white part of the clapper. And the screen shot below had a custom WB on the gray part of the clapper. I wanted to push my test a bit further but one of my light bulb just died on me. 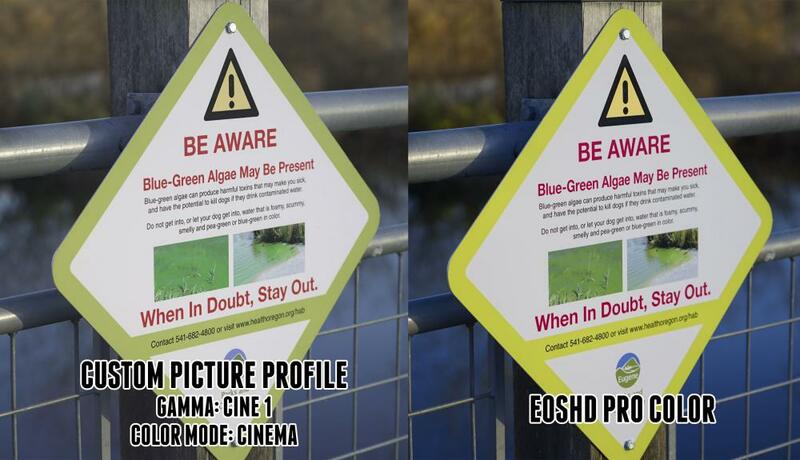 So I bought the EOSHD Pro color settings a few days ago and after inputting them to my a7s (original, not mkii) I was unhappily surprised by a big color shift in some shades like the images I'll post below. I've been messing with the settings a bit and I think it comes down to the color mode. For the original a7s, s-gamut is not giving me accurate colors at all. I think a better option would be to use one of the other color modes. I'll be doing more tests in the next few days, but right now I highly recommend not using s-gamut for the original a7s! I love the punchiness, saturation and contrast of the EOSHD Pro Color settings so I'm really hoping to find a work around for my camera! Have you tried pro instead of the sgamut? @Andrew Reid Is there a suggested way we could use these pro color settings in conjunction with your cineflat profile you made to mimic slog2? Thanks for your test bigfoot. PP 2 - EOSHD ProColor (Cinema) - at 0:46 looks fine. However the 3 way colour correction on top washes out the oranges and gives it a pale yellow cast. Was that intentional or is it my screen? Seeing such a difference I thought I would just do the needed white balance and shoot some short footage of these two signs. When I did in filming them they looked exactly accurate in the camera to what I was seeing on yours shots on the computer screen. Reviewing the footage it looks color accurate to these two shots of the traffic signs. So, I'm wondering it there isn't some difference between the A7S and the A7Sii that is causing this. If anything is off a bit in my footage for the blue in the Cine I in-camera profile. 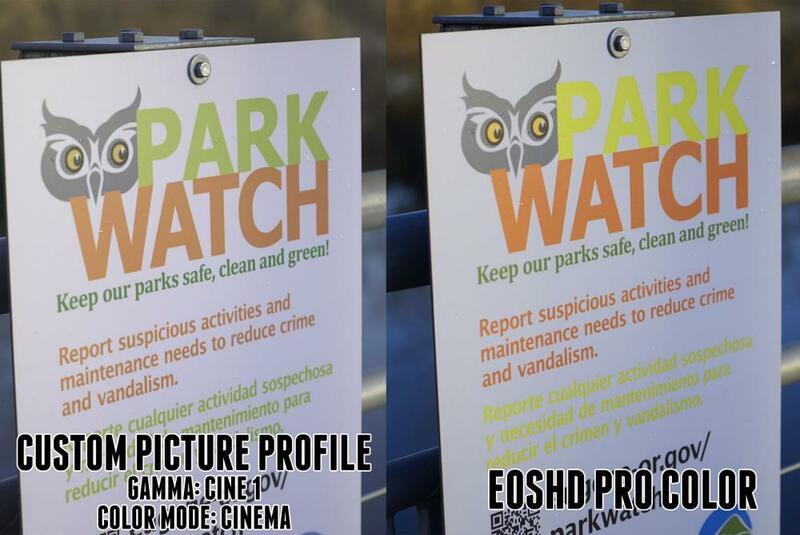 The EOSHD PRO COLOR seems to have a bit less red---and colors are punchier. Duh! like i've said i'm not a pro colorist at all - today I was trying to match those differents shots to a "basic level", standardise them so I could apply a lut or something like that. My screen need to be recalibrated soon too, but I'm not sure where that spyder went ... i'm also quite tired and didn't spent to much time on the 3 way grade. I've drop the saturation a bit too for some of them, That would explain the washes out oranges. There's definitely a big difference/improvement in the mkii from the a7s. Sony added a new color gamut which, I believe, is supposed to be more accurate with colors and better in general. I'm assuming these settings definitely perform better from the get-go in the a7sii, but we've got to alter them a bit for the original a7s. I also notice that you can control the colour depth on the A7S II with S-Gamut selected, but on the A6300 you can't. 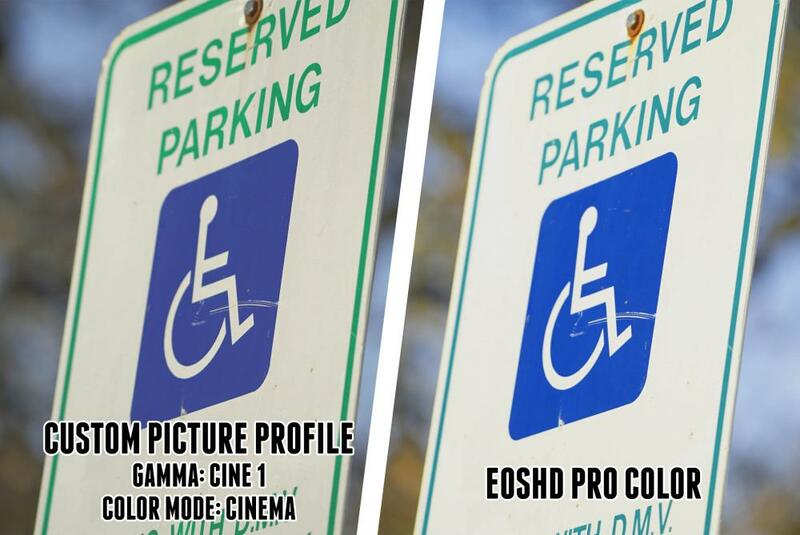 I'll be doing an updated EOSHD Pro Color soon and a few other tweaks. 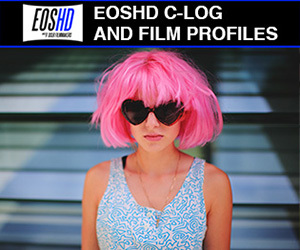 No need to email me yourself - I'll be emailing all EOSHD Pro Color customers once it's ready. like i've said i'm not a pro colorist at all - today I was trying to match those differents shots to a "basic level", standardise them so I could apply a lut or something like that. Ah yes but if you want to apply a LUT it's better not to shoot with a profile designed for baked in straight out of camera colour. That goes without saying for everything, always test new stuff before a shoot. There are some bugs in Sony's colour handling. The different behaviour of colour depth from A7S II to A6300 shouldn't be happening. I have made a second profile with a wider sweet spot, it delivers closer results across the different cameras, and you will all be getting it for free if you bought the original. I am also working on something else completely new and an A6500 review. I am now mega happy with Sony's colour after all this work. I might sell my 1D X Mark II. Woah, sell the 1DXmkii? Holy heck. 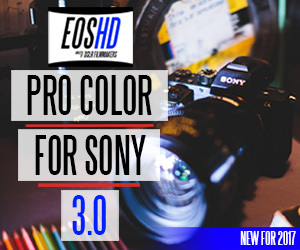 I'm currently testing the A7s2 Pro Color and will soon post some results...WITH skin tones, can you believe it. Andrew, speaking of SLOG2, you mentioned some video on SLOG2. You have put me back in the Sony business with these settings--but I have to say Sony color made me crazy before I switched to Canon--which is both wonderful and EASY with color. CLOG was child's play. My point is exposing SLOG2 was impossible for me. I attended workshops with Alister Chapman, tried to get the best information about proper exposure for SLOG, and it still drove me crazy. I did shoot one clip with your SLOG settings and used one of your LUTS and love how it turned out. BUT, that could have just been a fluke. I'm still at a loss of how to get the best exposure results for SLOG. I've heard Chapman on the matter. I'd like your take because I'd like to shoot a lot more with your SLOG because I like the LUTS you provided.